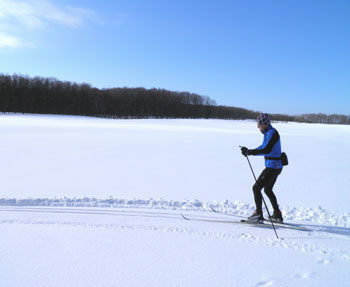 First impressions can often be misleading and cross-country skiing at Goodhart Farms is a case in point. From the winter trailhead you begin in an open and very flat field where often the groomed ski trail is wind swept and hard to see. Not the most appealing sight for Nordic skiers. But within minutes you are striding through deep snow in the woods and before the afternoon is over you’ll thrill to the exhalation of several downhill runs. Don’t let the view from the parking lot deter you. Goodhart Farms is a delightful place to ski. Skiers at Goodhart Farms. One of the Little Traverse Conservancy’s largest tracts at 645 acres, Goodhart Farms Nature Preserve is located 9 miles north of Harbor Springs and just east of M-119, the scenic drive known as the “Tunnel of Trees.” The preserve’s 8-mile trail system is the longest of any within Little Traverse Conservancy’s network of tracts and winds through a variety of terrain, from gently rolling fields to steep wooded hills. Most of the year the trails are popular with hikers, mountain bikers and equestrians but during the winter cross country skiers head to the east half of the preserve where 3.5 miles of trails are groomed and tracked for classic skiing when there is sufficient snow. And there usually is. 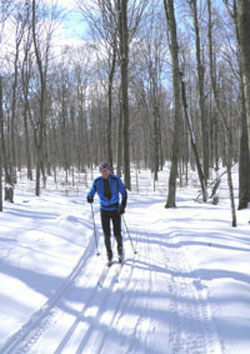 The real beauty of Goodhart Farms’ ski trails aren’t the downhill runs or the woods but their location. They sidle a ridge that rises more than 1,100 feet just 2 miles from Lake Michigan. That lofty perch allow the trails to catch and hold the usually abundant lake effect snow sweeping in from the west. The most direct route north from Harbor Springs to the winter trailhead on Robinson Road is State Road (County Road 77). But don’t pass up M-119 entirely. The state highway, famous for its autumn colors in October, is equally dramatic in the winter when the lack of leaves gives way to stunning views of a partially frozen Lake Michigan from the high shoreline bluffs. 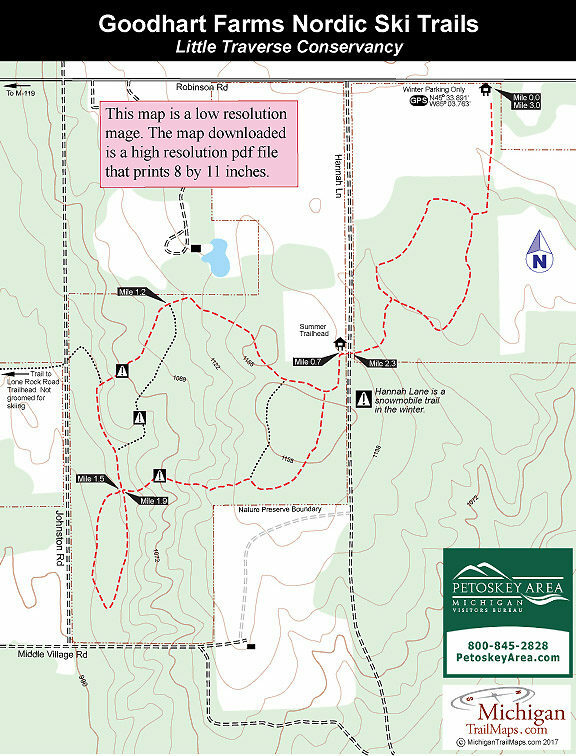 The ski trails at Goodhart Farms are basically a series of three, interconnected loops with the perimeter of them forming a 3-mile outing that can be skied in either direction. Keep that in mind when you’re speeding downhill. The description here follows a counter-clockwise direction. You begin by striding across an open field but in less than a quarter mile dip into the woods and past the return of the first loop. At Mile 0.7 the trail arrives at Hannah Lane, a dirt road that becomes a snowmobile trail in the winter. Look and listen before crossing! On the other side of Hannah Lane you pass three more junctions, the first being the return of the main loop, and the third reached at Mile 1.2. What began as a level ski turns into a mild downhill after the second junction and gets wickedly fun after the third junction that marks a spur you can use to climb back up the hill for another run down. You bottom out and at Mile 1.5 arrive at a major four-way junction where you pick up the third loop, a 0.4-mile level ski through the woods. Once back at the junction it’s a climb of 132 feet before you reach the top of the ridge a short distance from the Hannah Lane crossing. Along the way you pass a short spur that allows you to do the second and third loops again. Or call it a ski an head to Stained Cup Coffee Company in quaint downtown Harbor Springs. Nothing warms you up after playing in the snow like a mug of their whipped cream-topped hot chocolate or a bowl of their homemade soup. There isn't much at the winter trailhead other than parking. For rental skis or snowshoes stop at The Outfitters in Harbor Springs. The Outfitter (231-526-2621; www.outfitterharborsprings.com) rents cross-country skis and snowshoes and is located at 153 E. Main Street. 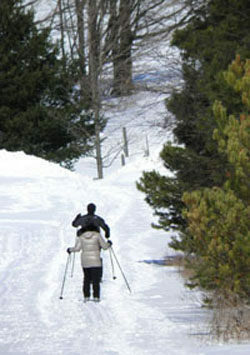 There are no trail fees to ski at Goodhart Farms. From Harbor Springs, take State Road north 9 miles to Robinson Road. Turn left on Robinson and travel 3.5 miles to the winter trailhead located east of Hannah Lane. For more information contact the Petoskey Area Visitors Bureau (231-348-2755, 800-845-2828; www.petoskeyarea.com). For more on Goodhart Farms Nature Preserve contact the Little Traverse Conservancy (231-347-0991; landtrust.org).